(Newser) – It's high drama in the obscure but passionate world of old-school arcade games. 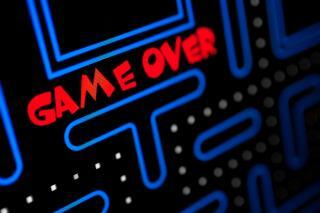 The organization that oversees records has stripped a top gamer of his high scores in Donkey Kong and Pac-Man, reports Polygon. The group, Twin Galaxies of Iowa, concluded after a lengthy investigation that Billy Mitchell did not play on an original arcade machine as required but instead used a software "emulator." The more damning implication is that Mitchell—previously credited with being the first to score a perfect game on Pac-Man and the first to crack 1 million points on Donkey Kong—faked his games. He adamantly denies it and promised in a video statement to prove his scores are valid. Still, Guinness World Records acted in accordance with Twin Galaxies and wiped Mitchell's records from its books, per the Washington Post. Because of arcade games from the past, it strengthen our eye to hand coordination. It was more than just a game with a couple of quarters. Ouch. You just know that's the only thing he has ever done in his entire life. Total Costanza.